A stylish, quiet and luxurious apartment in the heart of Barcelona. This stylishly designed Barcelona apartment is extremely quiet for its central location on Paseo de Gracia, as it is to the back of the building with no other constructions to obstruct the light coming through the large windows. The refurbished building in the very heart of Barcelona's city center has two fully renovated elevators to take you from the large and spacious entrance to the fourth floor where the apartment is located. With the best shops of Barcelona, bars, clubs and hundreds of restaurants right on the doorstep of the apartment, you do not need to go far to enjoy all that the old town of Barcelona has to offer. A holiday stay at this convenient accommodation will make your adventures around Barcelona easy to plan. The Monet I apartment is located right in the middle of Barcelona city only 50 yards from Plaça Catalunya and 100 to Las Ramblas, making it accessible to all areas of interest such as the Gothic Quarter, and the very trendy El Borne. A short walk from the apartment you will find the superb food and produce market called La Boqueria on Las Ramblas, an absolute must for any visitor to Barcelona. The apartment offers a quiet reprive from the bustling and very busy Las Ramblas but is close enough for guests to walk two, three minutes to where all the action is. Walk out the front door of the apartment building and you have a shopping experience just waiting to happen all around you. Paseo de Gracia alone will keep you busy for hours. Walk to Portal d'Angel about one minute from your front door and continue down to Portaferrisa where there are more stores for you to explore. A short five minutes' walk will take you into El Borne, one of Barcelona's oldest neighbourhoods, an intricate maze of plaças and squares all interconnected by narrow, medieval streets where you will find lots of trendy boutiques and great bars, cafés and restaurants. 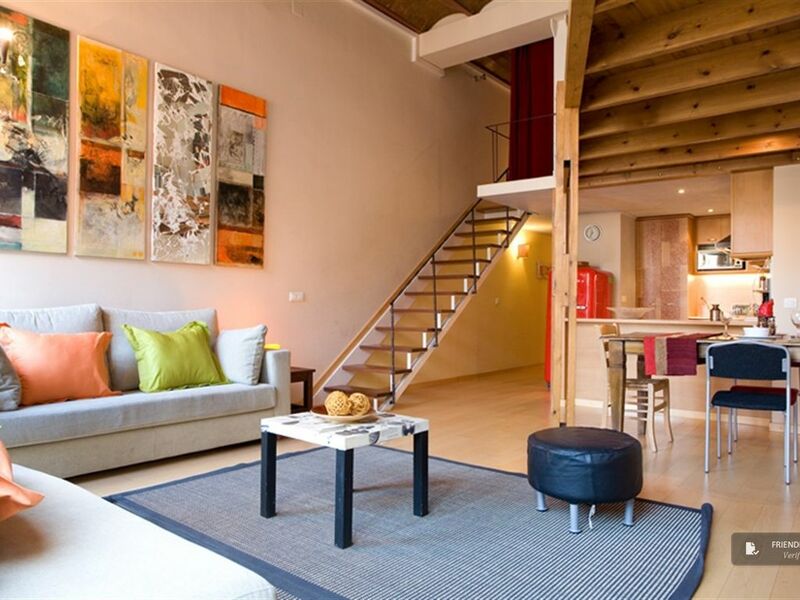 Another option for the visitor staying at this great Barcelona apartment is to visit the Gothic quarter situated right in the heart of the old town, about two minutes from your front door. This is the area that fell within the medieval walls and until 150 years ago made up the entire city of Barcelona. The area is a body of interconnecting narrow and cobble stoned streets where you can potter around for hours and explore the shops and restaurants. Las Ramblas is another must for the visitor in Barcelona: a two minutes' stroll from your front door. Here you will be amused and entertained by all the street acts as you make your way down to the food market and the sea. As you can see, should you choose to stay at the Monet I apartment during your visit to Barcelona, you will literally find yourself in the heart of Barcelona's Ciutat Vella. The Monet I apartment has been completely renovated and modernized to achieve the quality and high standard necessary to make this a luxury apartment for our visitor to Barcelona. You can see this from the moment you step into the tastefully, classically styled foyer, as well as the perfectly preserved facade of the 18th Century Palace where this apartment is located. This fourth floor apartment is perfect for four people and caters to their every need. The wonderfully large and spacious master bedroom is on the mezzanine floor; it features a queen size bed and an en suite bathroom with a bath and shower unit. The second bedroom is on the ground floor, contains two single beds and has its own bathroom with a shower. The decor of each bedroom has been kept tasteful and uncomplicated and there are large wardrobes, both in the upstairs bedroom and in the downstairs hallway, so that all visitors will have plenty of room for their belongings. The large and comfortable living room encompasses the stylish dining area suitable for up to six people. The large windows in the living room allow the sunlight to to pour into the apartment creating a lovely relaxed ambience. The modern look and feel of the living room blends easily with the old characteristics that have been preserved, mainly the wonderful wood features throughout the apartment. This area is where the guests of this fantastic, luxury apartment can relax and hang out and listen to music or watch TV. The modern art found around the apartment gives the Monet a wonderfully unique touch as well as adding colour to the whole ambience. The en suite bathroom to the master bedroom contains the bath, shower, sink and toilet, while a completely separate second bathroom downstairs has a shower as well as sink unit. The kitchen is fully equipped with vitro ceramic cooker, oven, microwave, fridge-freeze and dishwasher. You will also find all the comforts of home such as a kettle, toaster, juicer and so on, to make your visit to Barcelona easy and stress free. Bed linen, bathroom paper and clean towels are all provided. This apartment is essential when considering a luxury holiday in Barcelona with location, quiet and convenience as top priorities. This apartment does not have private parking; however, you will find public parking within 30 meters. The location could not be more central - very safe entry to apartment and simply cross the street to get to the bus to/from the airport. Great to be able to store luggage at Friendly Rentals office until check in time. But... there was not a 2nd set of keys in the apartment as indicated, and multiple phone calls and waiting around needed to resolve. There were not enough sheets for all beds, and no extras delivered while they were promised. The ceiling and shower head are so low in the upstairs bathroom that anybody approaching 6' would be miserable. The single bed mattress in downstairs bedroom felt like cardboard, and the downstairs shower is tiny, tiny - your elbow hits the faucet continually turning it off or cold. The drain was blocked, and this problem was resolved very quickly (thank you!). The area that supposedly housed a second single bed was a loft with a steep ladder had only two large cushions - unsuitable for comfortable sleeping. We were told the apartment could sleep 6 - and it would have been a stretch. These apartments come with a small bag with single serving sized olive oli, vinegar, dish soap. a laundry pod, a dishwasher pod, a dish rag --- don't expect anything else to stock a kitchen, etc. It was clean and bright. You can't beat the location of this apartment in Barcelona - half a block away from the main square and the top of the Ramblas; walking distance to Barre Gotic and Eixample sites and experiences. The pictures accurately show the property, which is on a very busy street, but the apartment is on the back side of the building, so it is quiet. The view from the floor-to-ceiling window is just the back side of office buildings, but the place gets plenty of light and is very pleasant. The management company was very responsive to our one concern - the wifi did not work when we first arrived. That was taken care of, although the wifi speed was always quite slow and coverage was inconsistent in the apartment. There are a couple of things to be aware of in renting this apartment. The loft area upstairs is set off just by curtains, and so any noise from downstairs can be problematic. The upstairs ceiling is quite low: at 6'2" (~1.9 m) I could stand in the upstairs bedroom, but with very little clearance. The main bathroom floor is raised, and the shower is higher still - Anyone over about 5'10" (~1.8 m) will not be able to stand upright in the shower. The bed in the master bedroom has a futon mattress that is very hard and uncomfortable (and I prefer a firm mattress). The 2nd bedroom mattresses are also very hard. Overall, the location and ambience of this apartment make it attractive. Adding good mattresses would be a simple fix that would greatly improve the experience of staying here. The apartment was in an excellent location with easy access to the metro and the bus for the airport. We felt secure in the building and we were grateful for the elevator/lift. The apartment itself was a good amount of space. My aunt and I appreciated having our own bedrooms and bathrooms. On the downside, the internet only worked about half the time and there were minor maintenance issues like a burnt out bulb in the bathroom and a clogged drain in the tub. Also, having to go to a separate location to sign the contract and pick up keys was not convenient. A few adjustments would make this apartment not just a good place to stay but an excellent place to stay in Barcelona. This apartment suited two couple very well. It is a very central place in Barcelona. Bright , well equipped and comfortable.Best is they have a lift so you don't have to carry heavy luggage up stairs. Location is a 10. Perfect size for our family of four. WiFi good. Lots of hot water. Ideal location and really nice apartment. It had everything we needed. It was really hot during our visit. The air conditioning was perfection. Highly recommend! !